We are excited to hold our first event of the year – a new event that we are certain will become an annual one. The Sip and Savour Wine Festival is happening on Saturday April 27th at the Peachland Community Centre. Wineries from Summerland, Peachland and West Kelowna will be featured as well as some cideries. Find all the details and to purchase event tickets HERE. 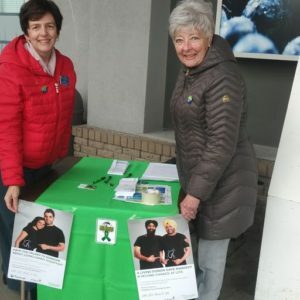 On Saturday April 6th Chris B., Ted, Rod, Linda, Peggy, Anne and other Rotary members were on hand at the Peachland IGA for “Green Shirt Day” bringing awareness of the organ donor program to shoppers who passed by. Many were interested to find out where they could register. To find out more information on being an organ donor, visit their webpage and hopefully register. 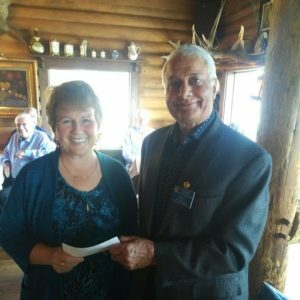 On Thursday, April 5th, President Ray presented a cheque for $1,000 to Judy Bedford of the Peachland Food Bank. Thanks to all the club members for their dedication to the raising of funds for this very worthwhile cause in our community. Here is a video from a drone of the completed pier courtesy of Mark Weinstein. A big thank you for sharing this with us. Click on the arrow to start the video and if you want to see it full screen, click on the box in the lower right corner to enlarge. To view more photos, as well as the latest Peachland View article of February 5th, go to the “Peachland Pier” tab on this website. 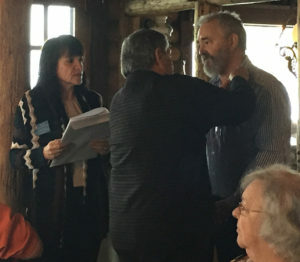 Membership Chair, Madeleine inducted our newest member Steven to our club at our annual general meeting on January 17th. Here Wolfgang, as his sponsor, pins Steven with his Rotary pin. All the members in attendance shook his hand to welcome him to our club. 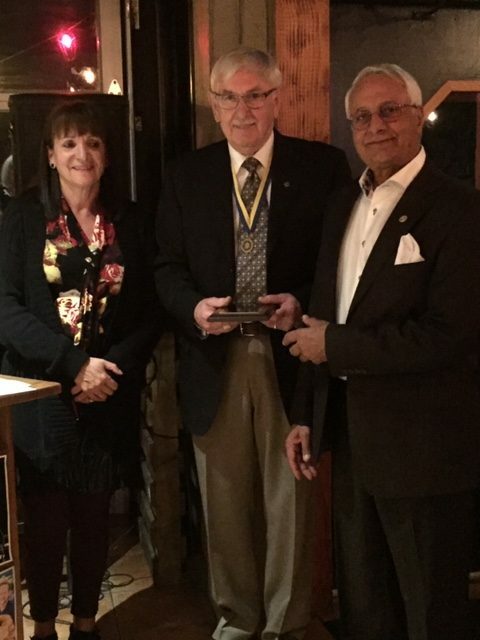 We also know his previous experience with Rotary will help in our club’s many fundraising endeavours. 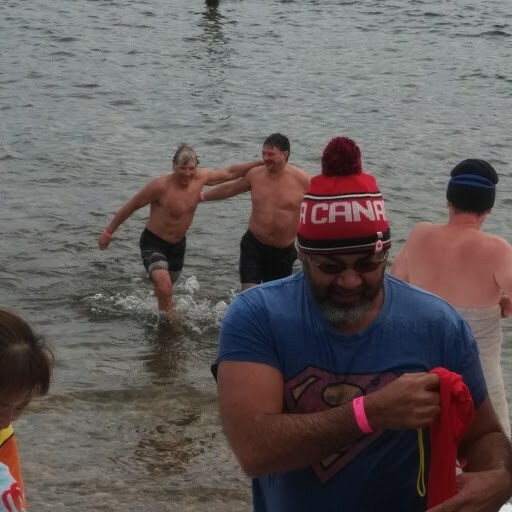 Our first club event of the 2019 year was to provide hot chocolate at the annual Polar Bear Swim in sunny, but cold, Peachland. Read more about this event and see lots of photos here. 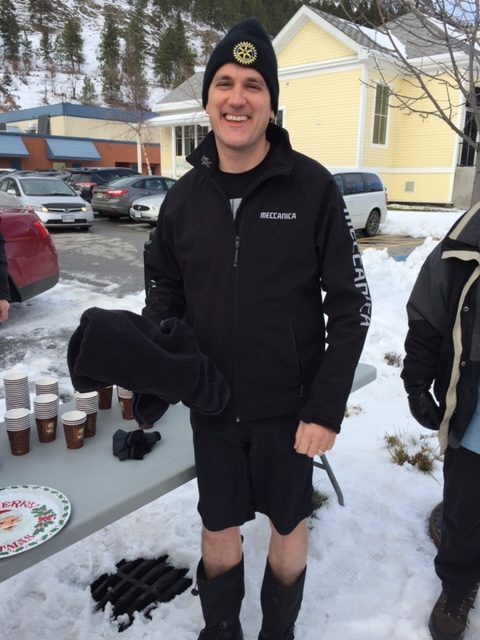 The photos below show fellow Rotarian and MP Dan Albas just prior to his plunge into the frigid waters! 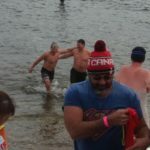 Also Rotarian Shayn Moritz with Dan after their swim. 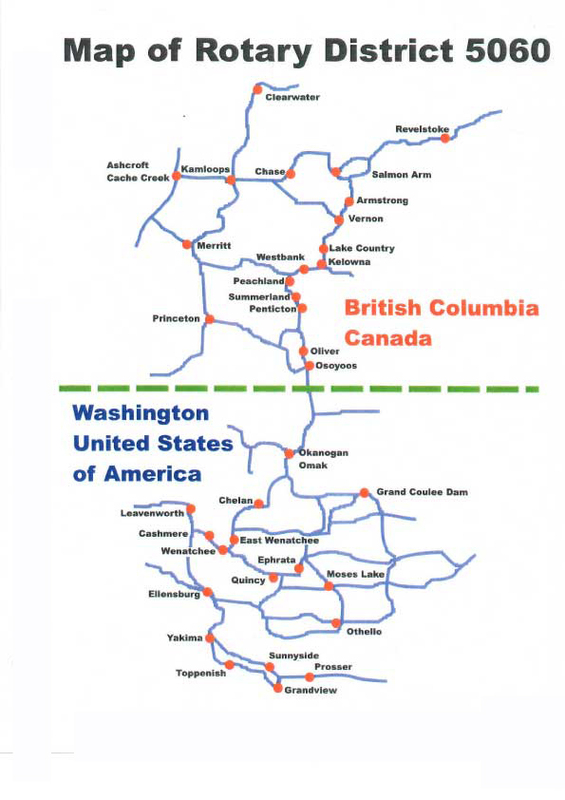 Click on image to enlarge to full size. On Friday, December 5th, Santa arrived at Heritage Park in style aboard Peachland’s newest fire truck, accompanied by legions of bundled-up elves and would-be elves all waving glow sticks. 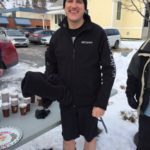 It was Light-Up in Peachland and the weather could not have been been better – about minus 2, no wind with a skating rink lake as a backdrop… Click here to view the remainder of this write-up. 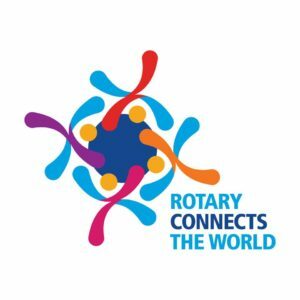 It is this Foundation that enables Rotary clubs worldwide to fund projects around the world as well as in our backyard. 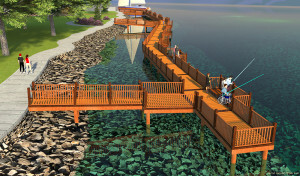 For example: part of the funding for our Pier Project is derived from a grant from the Rotary Foundation. 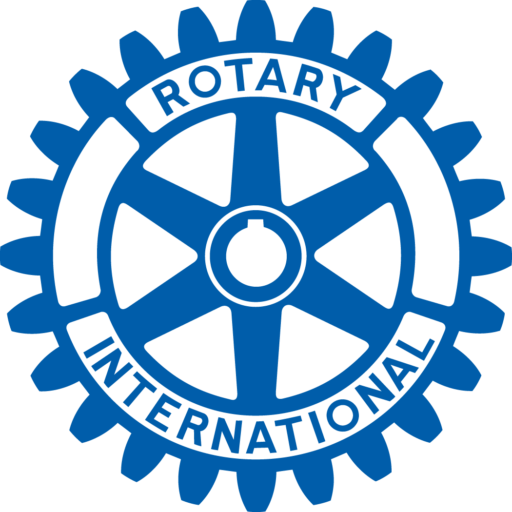 Rotary considers projects which support the community and matches some of the funds raised by local clubs to further their endeavours. 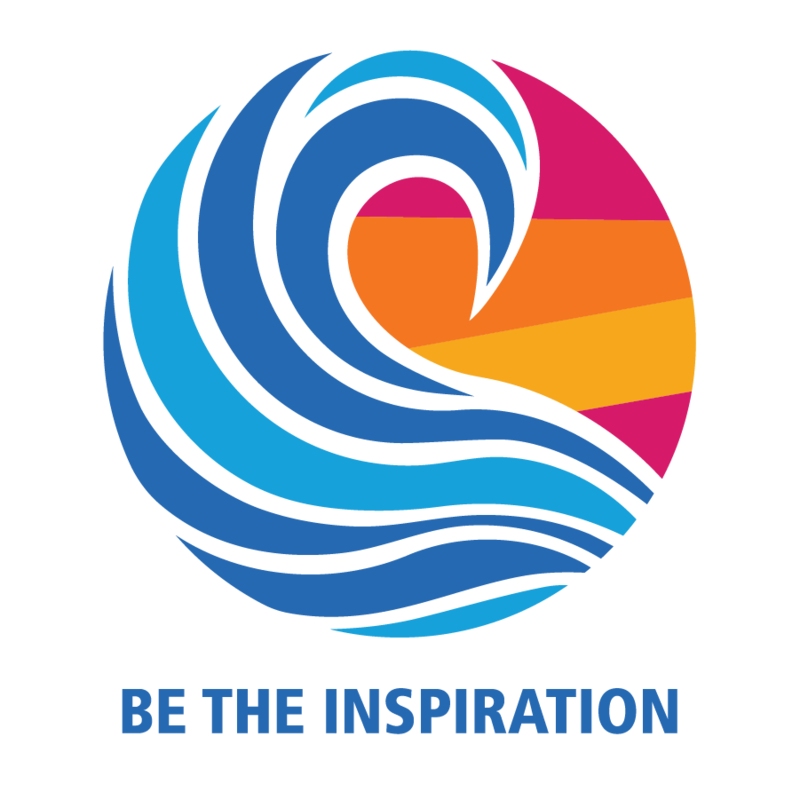 For the 10th consecutive year, The Rotary Foundation has received the highest rating — four stars — from Charity Navigator, an independent evaluator of charities in the U.S. In the most recent ratings, the Foundation earned the maximum of 100 points for demonstrating both strong financial health and commitment to accountability and transparency. The rating reflects Charity Navigator’s assessment of how the Foundation uses donations, sustains its programs and services, and practices good governance and openness. The Lake Country Rotary Club took the lead, along with 11 other District clubs working together to provide a much needed fork lift for the Lake Country Food Bank. On October 26, Rotarians gathered for the presentation (click on the image to the left for a list of the clubs that raised funds, along with a grant from the Rotary Foundation, for this project). Learn more information about this project here. 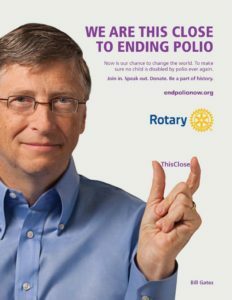 It was a fun event for World Polio Day on Wednesday, October 24th. 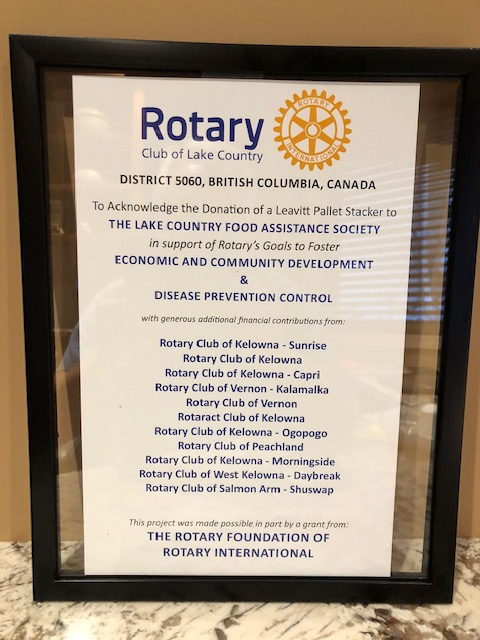 Our Club celebrated this very special event by participating in the “World’s Greatest Meal to Help End Polio” along with the West Kelowna Daybreak Club. 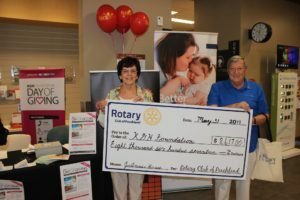 Approximately $8000 was raised for the Rotary Foundation to Help End Polio. View many photos and learn more about this evening and our guest speaker Karen Naumann, a polio survivor, here. Our President Peggy Southin and Wolfgang Muhs presented a cheque for $8,617 to the KGH Foundation. This amount was matched 1:1 by a private foundation bringing our contribution to this worthwhile project to $17,324. As of September 28, 2018 BC Clubs Supporting JoeAnna’s House have received gifts/commitments totaling over $40,000. Our club’s donation will help with this very vital project. View photos and information about JoeAnna’s House groundbreaking ceremony here. What an evening our fellow Rotarians and their guests experienced for the celebration of the Peachland Rotary Club’s 1997 Charter. The meals were delicious and the fellowship made for a fun evening. 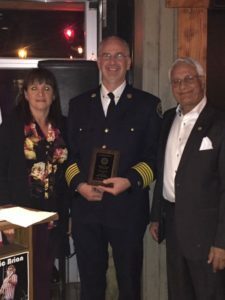 A highlight of the evening was the presentation of the Unsung Hero Awards by Membership Chair Madeleine Nixon to fellow Rotarian, Chris Scowen and Chief Dennis Craig, who received the award on behalf of the Peachland Fire Department – Station 21. Congratulations! Chris also gave a detailed history of the club’s charter and provided a program and other memorabilia from the first meeting (View them here). 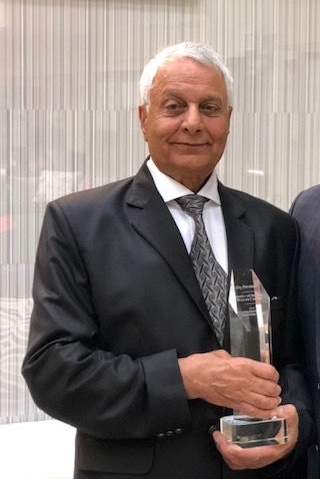 Read more about the many accomplishments of the award recipients and this evening in the Events section. Also view a photo gallery from the evening. 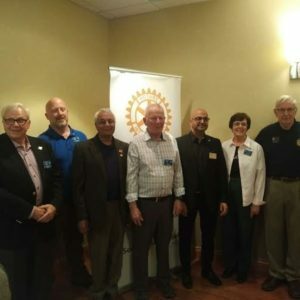 Our Rotarians and guests were delighted to have Raghwa Gopal of Accelerate Okanagan as our guest speaker today (October 18th). Where he finds all the energy to be involved in his many ventures is simply amazing but he managed to find time to visit us today! 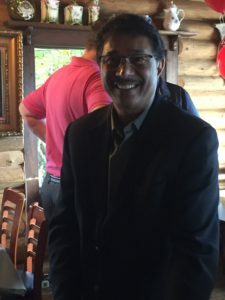 Read more about his presentation in our Our Meetings tab. 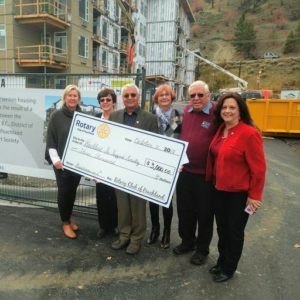 Peachland Rotary members approved a project to provide appliances and a television for the Peachland Seniors Centre common room. 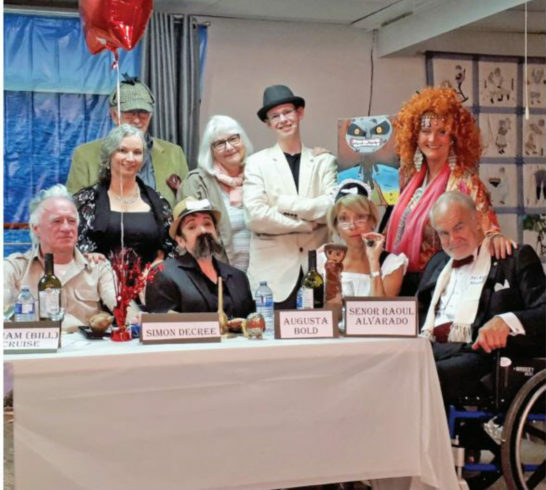 Profits from the recent Murder Mystery event funded a portion of the $3000 donation for this project. Rotary President Ray Kandola, as well as members Chris Boyle (photographer), Peggy and Chris Southin, were on hand to present a cheque for $3000 to the Peachland Senior Support Society on Thursday, October 11, 2018. The Starfish Pack Backpack Programwas created in response to teachers learning that some of their students’ families needed help to provide a few of their family meals. Teachers were heartbroken to hear their students were coming to class Monday morning hungry, reporting that they had not eaten over the weekend. 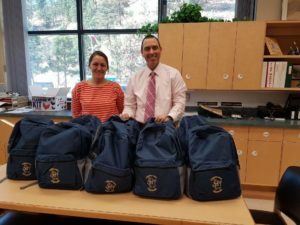 Our club’s Starfish Pack Backpack program began with a relationship with Peachland Elementary School in the 2017 school year. Learn more about this worthwhile program here. 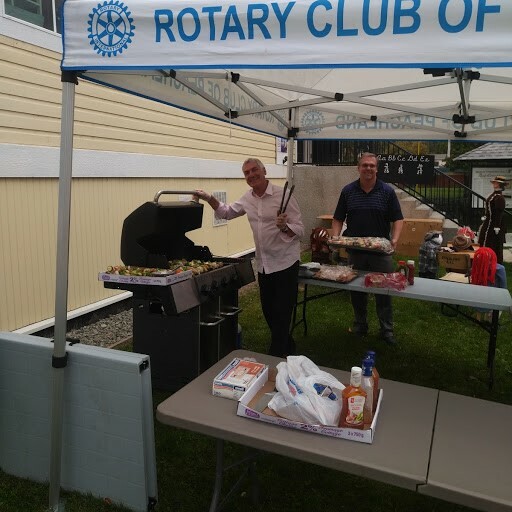 Our fellow Rotarian Constantine Anastasopoulos applied his cooking skills at the Peachland Chamber of Commerce BBQ. A Rotarian hard at work! We are so proud of the team of teachers who do an incredible job of changing the lives of many children and giving a very poor community a future. They are truly an inspiration not only to these kids but to all of us. 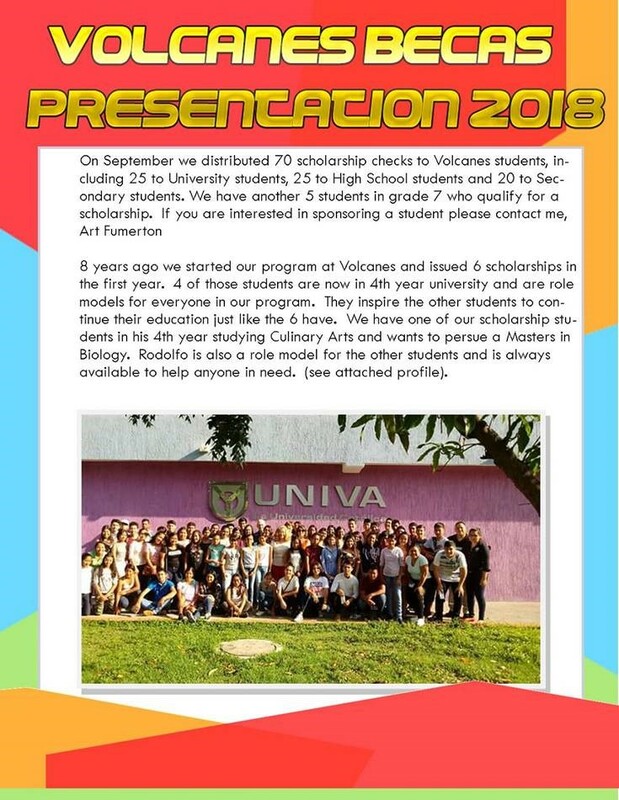 In the recent September newsletter, there is an article on the history of the scholarship program (click on thumbnail image to the left). 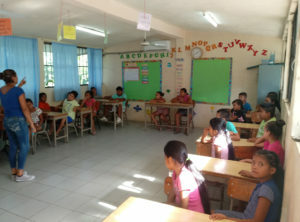 The program started 8 years ago with 6 students. 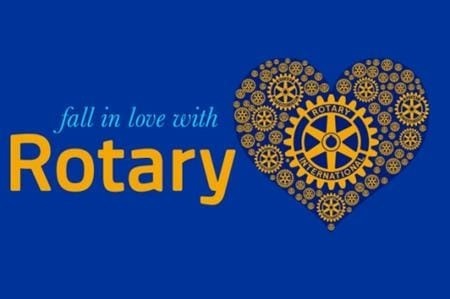 Now Rotarians from all over support 70 students, many of them attending University! Yes, we can be an inspiration and change the world, one student at the time! To view past and present newsletters click here. To view more about this project in our website, click here. 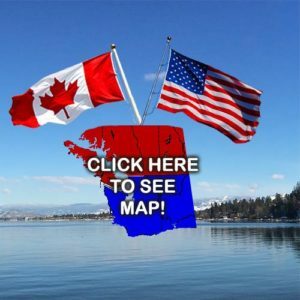 Soon Peachland will Walk on Water! A handful of representatives from the Lions Club, the Sportsmen’s Association and our club were present on Sept. 10th to mark the start of construction of the Peachland Heritage Pier. The pier represents the largest local project ever undertaken by the three service clubs. See more information and photos here. What a fantastic event it was on Saturday, September 29th with 106 attendees enjoying themselves at our “Deadly Passage” Murder Mystery Dinner. See photos from the evening here. 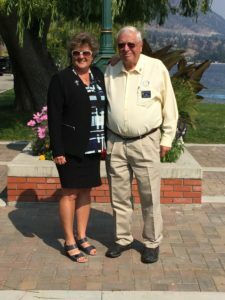 Funds raised from this event will be used for the purchase of appliances and a TV in the common room of the Peachland new Seniors Centre residence. 2018 and another year of dreaming big begins for “our kids” at Volcanes in Puerto Vallarta, Mexico. We are so proud of this program. For more information and photos, click here. Peace Concerts a Success Despite the Smoke! The 2018 Peace Concerts were a challenge! The July concerts went as planned featuring COD Gone Wild and Flint and Feather with sunny skies and warm temperatures. August proved to be the “smoky” month resulting in poor air quality due to smoke from the many fires around the province. 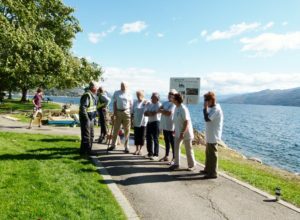 As a result, the Kelowna Opera concert unfortunately was cancelled over 10+ poor air quality which would greatly affect the throats and lungs of the scheduled performers. The final concert, featuring Country Classics with Marty Edwards and Pam Ferens, with last minute planning, was re-scheduled to a week later and was moved to the Peachland Community Centre. The fans were not disappointed! A wonderful concert with approximately 240 guests who were treated to an hour and forty minutes of great music. As guests left they were thanking us for a super evening and they said they will be back. The audiences, as in previous years, were generous in their donations going to purchase Shelter Boxes to be used around the world wherever natural disasters make families homeless. We look forward to season 2019 at the Rotary Pavilion in Peachland with plans for a fresh and thrilling complement of musical performance. Hopefully we will have smoke-free skies as well. 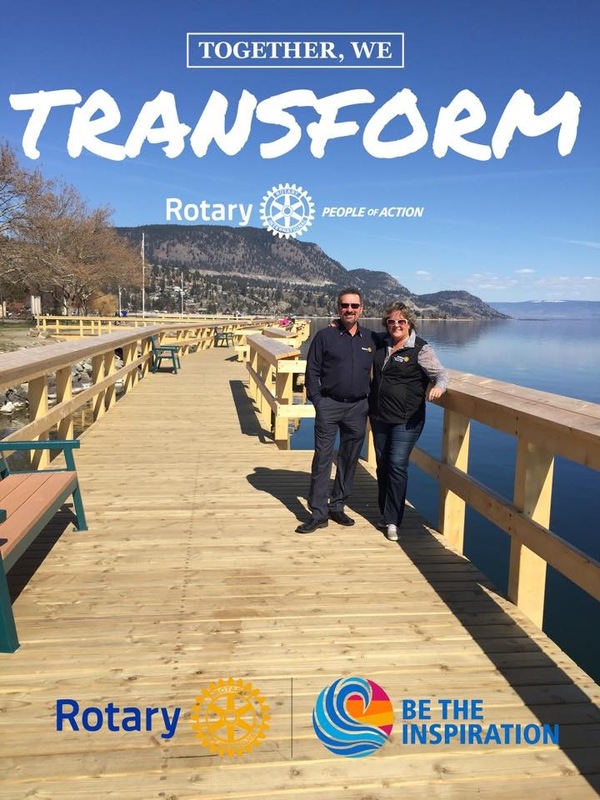 Peachland Rotary has donated funds for 3 rollers and challenges all District 5060 Rotary Clubs do the same or even better! “For many, clean water comes with the twist of a tap. But in rural Africa, access to water requires hours of walking, waiting in line and heavy lifting. On average, a woman spends six hours a day collecting and transporting water to supply her family’s daily needs. The time spent on this basic necessity keeps many children out of school and prevents women from engaging in more empowering activities and income-generating work. 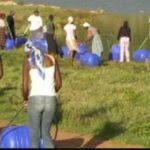 The hippo water roller is a major improvement on the toxic, re-purposed gasoline and paint containers that are typically used to collect water in rural communities. Traditional methods of transporting water include carrying heavy five gallon buckets of water on the head. These heavy loads place an enormous strain on the skeletal frame, causing long-term damage and premature ageing”. View videos and more information here. 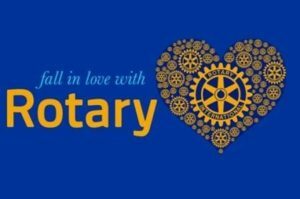 “Rotary is a leadership organization…..
local business, professional and civic leaders.